Moeraki Boulders are unusually large and spherical boulders lying along a stretch of Koekohe Beach on the wave cut Otago coast of New Zealand between Moeraki and Hampden. They occur scattered or isolated. The erosion by wave action of mudstone, comprising local bedrock and landslides, frequently exposes embedded isolated boulders. These boulders are grey-colored septarian concretions, which have been exhumed from the mudstone enclosing them and concentrated on the beach by coastal erosion. The Moeraki Boulders are a big attraction, found on Koekohe Beach near Moeraki on New Zealand’s coast. The huge, gray, spherical stones formed in sediment on the sea floor 60 million years ago and were revealed by shoreline erosion. 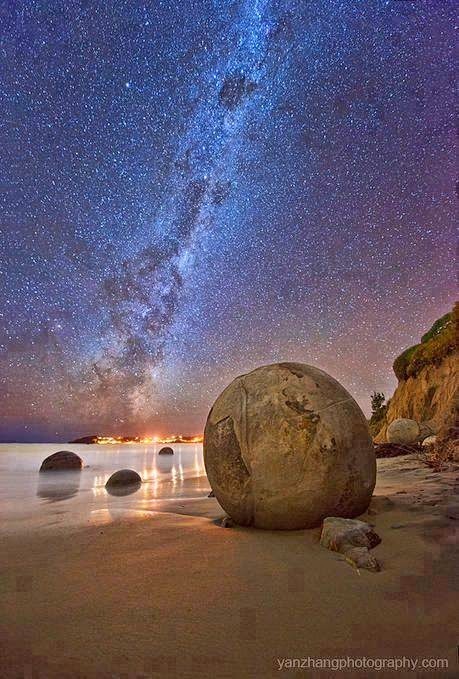 The Moeraki Boulders are a big attraction, found on Koekohe Beach near Moeraki on New Zealand’s coast. The huge, gray, spherical stones formed in sediment on the sea floor 60 million years ago and were revealed by shoreline erosion. The boulders, some of which stand alone and some in clusters, can weigh several tons and measure 10 feet across.